During the first three months of 2018 Fellowship Bible Church’s teaching pastors looked at prayer through the eyes of Jabez, the story of Job and what it can teach us about dealing with suffering, and how to take our faith into the workplace. What is so special about prayer that God calls us to it? By using the prayer of Jabez as a model pastor Aaron Tredway lays out the benefits of prayer and calls everyone to double down this year on their commitment to praying. Prayers do not have to be complicated or grand to be impactful. Jabez prayed a simple prayer to know God better. Aaron Tredway’s message this week looks at the effects of prayer on the seen and unseen world around us and why it matters. In part two of this guide to prayer pastor Aaron DeLoach unpacks why prayer is one of our primary callings as a follower of Christ. Among others it keeps us connected and aligned with God no matter what our circumstances in life happen to be. In this six part series the teaching team at Fellowship Bible Church explores the topic of suffering by looking at the story of Job. Using his trials at a backdrop they ask tough qustions about the nature of suffering, how we can handle it in our own lives, and how we can help others through their times of difficulty. Job was an upright man who was obedient to God. Why then does it seem that God allowed him to be severely tested? Pastor Aaron Tredway tackles this very difficult question to help frame the question of suffering for those who are faithful to God. Worship is not just appropriate when times are good. In the story of Job he loses his wealth, his family, and almost everything else. Even so he never accused God of abandoning him. Instead he turns to worship to find God in the midst of his pain. How can we do the same in our lives asks Joe McGinnis. Our habits and daily practice shape our lives in both good and bad times. Integrity isn’t something that can be built overnight but requires intentional effort. Using Job’s response to God as a framework pastor Aaron DeLoach teaches how to avoid the trap of spiritual procrastination. When we are facing suffering it can be important for others to help us through those difficult times. What are some important Dos and Don’ts for responding to the suffering around us? Pastor Aaron Tredway demonstrates several techniques for what to do and what to avoid as we comfort others. When suffering comes into our life it is tempting to challenge God and ask why He isn’t making things better. 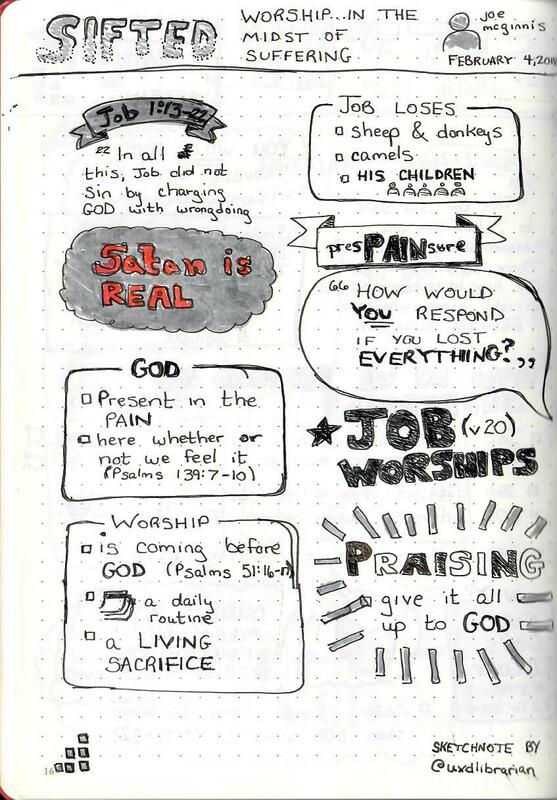 When Job does this God responds with over sixty questions that make Job look at the big picture. The larger context doesn’t make suffering any easier to handle. According to pastor Aaron Deloach the way that we approach it can grow our faith as we ask “What are you doing” rather than “Why are you doing this”. Even long after we are finished going through trials in our life the impacts can be far reaching. Job may have been blessed by God with twice as much wealth and children as he had before. However, as pastor Joe McGinnis points out, he also still had to cope with the loss of his first children. 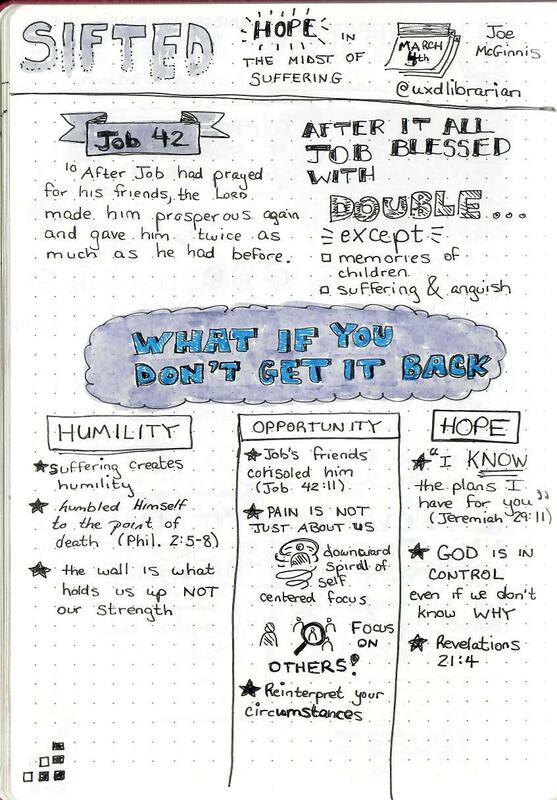 What do we do when God doesn’t give us back the things we had before our suffering? Work should be more than a means to an end. In this sermon series the team at Fellowship Bible Church examines how to approach work and what we can do to take our faith into the workplace. Whether we work in retail, in a cubicle, or anywhere else our work should be more than a way to pay the bills. God designed humans to work. In this sermon Aaron Tredway looks back at the story of creation to see how Christians can approach their works with a world view that puts the emphasis on Christ and not on the world. Whatever our profession our identity is defined by Christ. That means you do not need to be a missionary or a pastor for your work to have spiritual meaning. Pastor Aaron DeLoach explains why our primary calling makes everything we do sacred and not just Sunday mornings.